US, 2012, 105 minutes, Colour. Benjamin Walker, Dominic Cooper, Anthony Mackie, Mary Elizabeth Winstead, Rufus Sewell, Marton Csokas, Joseph Mawle. Well, the title is certainly provocative. It may mean that serious moviegoers (and historians and history aficionados) may be crossing it off their list of must-see films. That would leave only the action and graphic novel fans (which could, of course, include some historians) and the curious. This review comes from a curious historian. If someone is going to make a film with this title and with this imagination, it might as well be done like this. I am not sure whether I should be writing this – but I enjoyed it, especially the playing with history (somewhat like Anonymous with Shakespeare’s plays and the Duke of Oxford) which in no way undermines the reputation of Lincoln. For those concerned about Lincoln and history, Steven Spielberg’s forthcoming portrait with Daniel Day Lewis will set the record straight. So, what is happening here? Graphic novelist, Z, has adapted his story for the screen. And the director is the flamboyant Timur Bekmambetov (the Russian films Day… and the American actioner, Wanted). Supported by designers, costumers and seemingly legions of special effects experts, he offers a colourful film, playing with vampire myths and inserting them into Lincoln’s life as well as the waging of the Civil War. Apparently, when Lincoln was a boy, a savage plantation owner (Marton Cokas) is confronted by Lincoln’s father when his wife is attacked and killed. The boy had been defending his black friend, William. Lincoln is bent on revenge until he meets a vampire hunter, Henry (Dominic Cooper), is instructed in confronting evil as well as in fight and weaponry techniques plus a philosophy of ridding the world of evil instead of being Abe works in a store, is dragged to meet Mary Todd whom he eventually marries. He begins to study law, is persuaded to become political, especially after he meet Wiiliam (Anthony Mackie) again and, especially when he is tricked into travelling to New Orleans to a vampire coven to rescue the abducted William and becomes aware of slavery first hand. The coven is presided over by the arch villain, Adam (Rufus Sewell). Lincoln becomes the advocate of freedom for slaves, especially when he is elected to the congress and, of course, when he becomes president. At these stages, the vampire hunting becomes less, the social, poiitical and freedom issues come to the fore (which could make the action fans who may not be on the history wavelength rather fidgety). The author works the vampires into the Civil War scenarios. Adam wants to win the war so that American will become a free vampire country. But… with some twists and inventiveness and a huge set piece on a train with a vampire attack as well as a bridge set alight (quite spectacularly) and the train on the verge of plunging off the bridge. Obviously, as Abe speaks the Gettysburg address, he has more in mind here than freedom from slavery – a realization of what might have been. While Benjamin Walker (looking like a younger Liam Neeson) and the cast play it straight, the vampire cast, especially Rufus Sewell, have tongues in cheek. This invites us to take it all seriously even when we know it is all made up and far-fetched. It could set precedents for heroics of other presidents. ‘Teddy Rooseveldt in Cuba, Voodoo Pursuit’? 1. The title, expectations? Serious? Comic? 2. The basis in a graphic comic? Invention? Fact and fiction combined? The heroic Lincoln? In his politics? In vampire hunting? The combination? The visuals of graphic novels? Action? 3. Audience knowledge of Lincoln, history, the issues in the United States, the Civil War? His assassination? 4. Audience response to vampires, vampire legends, folklore, explanations? 5. 19th century America, Illinois, 1818, New Orleans, Washington DC, the Civil War, recreation of the period? Musical war? 6. The Civil War, the action sequences, the visceral presentation of the battles, reality, the vampires fighting? The special effects? 7. Abraham Lincoln as a boy, his encounter with Jack Barts? Barts’ appearance, the attack? The friendship with William, defending William, interracial friendship? Lincoln’s father, his debts, his wife, the attack, death? Lincoln and his revenge motivation? 8. The passing of the years, Lincoln and his search for Barts, his motivation, the build-up to the confrontations? 9. The bar, the encounter with Henry, the gun, their discussions, Henry recruiting Lincoln, the extensive training, weapons, folklore about vampires, axes, silver? Henry and his list? The types who became vampires? Lincoln and the confrontations, the hunting, the fights, deaths, burial? 10. The diary and its importance? Lincoln and his confiding his thoughts and feelings? 11. Lincoln settling down, the friendship with Joshua Speed? Helping him, work, the ball, the encounter with Mary, the dancing, the suitors, the picnic – and the marriage? 12. Mary, a strong character, determined, the senator, the invitation to work for politics? 13. William, his arrival, friendship with Lincoln, their working together, the capture, Lincoln going to New Orleans? The encounter with Adam, the vampires, the party, the fight and escape? The introduction of the slave route? 14. The character of Adam, ageless, his associates, the history of slaves, the pyramids, surviving, his wanting a vampire nation? 15. Lincoln, his speech, the people listening to him, going into politics, going to Washington, election as president, the verge of Civil War, slavery issues, William and Speed and their support? Mary? 16. The female vampire and her role in the White House, playing with her son, the son’s death, Mary and her bitterness? 17. Henry, his reappearance, helping Lincoln, the fights, the time for the final confrontation with Barts? 18. Slavery, the south, the refuge in the north? Henry and the visuals of war, his advice, the dead? 19. The confederate soldiers, Jefferson Davis? Adam and his influence? The vampires, the fight, slaughter? 20. The politics, Adam and his role, Jefferson Davis and the leadership of the south, the vampire warriors? 21. Lincoln, desperation, the discovery of the fork and the silver, collecting the silver, transforming it? 22. Speed his going to Adam, acting the part of the traitor? The build-up to the train, the voyage, the guards? The silver, the vampires and their lying in wait for ambush? 23. 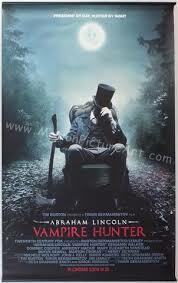 The train, the attack, the vampires, the woman and the confrontation with Lincoln? The axe, her death? The action sequences, the high bridge, burning, the irony of the rocks instead of the silver? 24. The alternate route, Mary and her leaving the White House, the arrangement with the slaves, the vampires and the confrontation? The delivery of the silver? The consequences for the Civil War? The use of the silver? Adam, the confrontation with Mary, the necklace? 25. The Gettysburg Address – the film’s relying on serious aspects of history? Incorporating the Civil War battles as well as Gettysburg? Lincoln, his reputation, his death? 26. The epilogue, Henry, his continuing to live, his place in the 21st century – and continuing to recruit? 27. The imagination of the writers, the director? The graphic novel – history, fiction and what if ....?